Today’s the big day!! The waiting is finally over! The Verizon Tech just called, and he’s on his way to my house now to start the install. Goodbye DSL, HELLO FIBER! Now, let’s get to the testing! To be completely honest, my DSL service at home was just fine. No complaints. Sure sure it was a little slow when my wife and I would download something from Amazon Unbox through our TIVO but whatever. 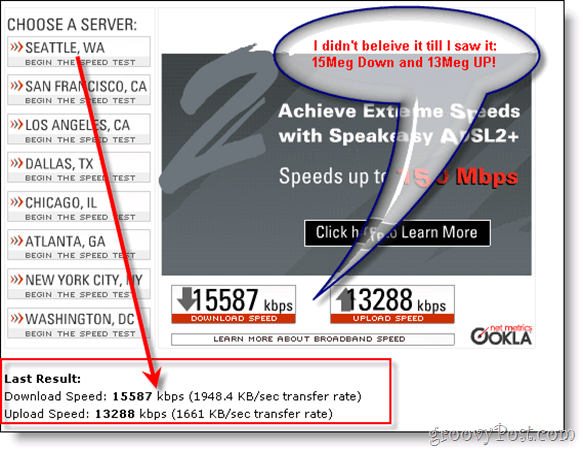 Like any good geek I wanted to document the BEFORE and AFTER results (DSL Vs. FIOS) so read on and enjoy. The first Shot is BEFORE the FIOS installed. 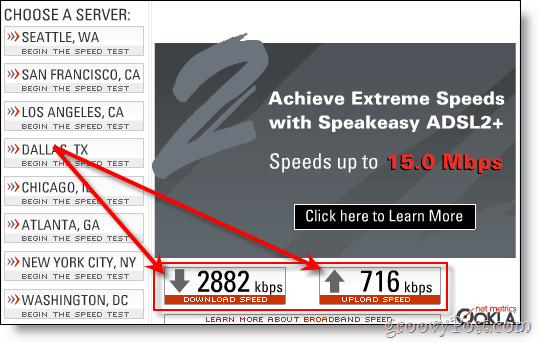 I generally use the SpeakEasy.net speed test tools for my testing but I also like SpeedTest.net and good old faithful DSL Reports. As you can see on the right, my DSL actually performed pretty well. 2882 kbps down and 716kbps up. Not bad at all. I tested my bandwidth against all but a couple of the servers and it really didn’t move much from the screen shown here. After about 3 hours and a few new holes in the side of my house (pictures to follow), I was once again up and running and ready to test my new line speed. Same as before, I hit the various sites and overall, the conclusions were the same. FIBER to the house IS INSANE!!!! Yeah….. I said the same thing. The speeds are just INSANE!! The overall average against both SpeakEasy and SpeedTest are ~ 15.5 Megs up and ~ 13 Megs Down….. I spent about an hour doing several tests and overall, I’m very happy with the new line speed. So, how did things test out in the “REAL” world? Pretty well actually. I hit the Microsoft MSDN Subscriber download site and downloaded the Windows Server 2008 in record time. PS: Here’s the data from DSL reports. Not as good as the SpeakEasy testing; however, I also don’t have a server near my home. Perhaps that explains it? Oh, oh, OH so groovy! Two Words – Verizon FIOS!! !